The time has come to catch up on the numbers behind the Fugitive AvA Phase. This phase, in addition to many of our tried-and-tested Alliance friends, it was satisfying to see some less familiar Alliances take regional titles. Through an apparent strategy of focusing on particular regions--to the exclusion of all others--Alliances such as Knights of the Queensguard and Raiders of the Narrow Sea were able to win their second rank titles. A simple strategy, to be sure, but effective. Congratulations to them, and all title winners. While on the topic of title winners, we thought the way things unfolded in Stormlands was particularly interesting. While it appeared that the hard-working Magister Mortalis was destined to take the 2nd Rank Title, on the last day What is Dead May Never Die Harder overtook them, apparently snatching the title from their hands. Goes to show, even now, AvA can hold a surprise or two. Harmful and Helpful Actions were up to their usual tricks. GoW pounding Shenanigans, and vice versa in the Harmful Actions. Some interesting, strategic patterns when it comes to Helpful Actions. Which is to say, you can learn a lot about how the battles went down by looking at these two tables. This phase, we thought we would once again see what the “Blood Map” looks like. 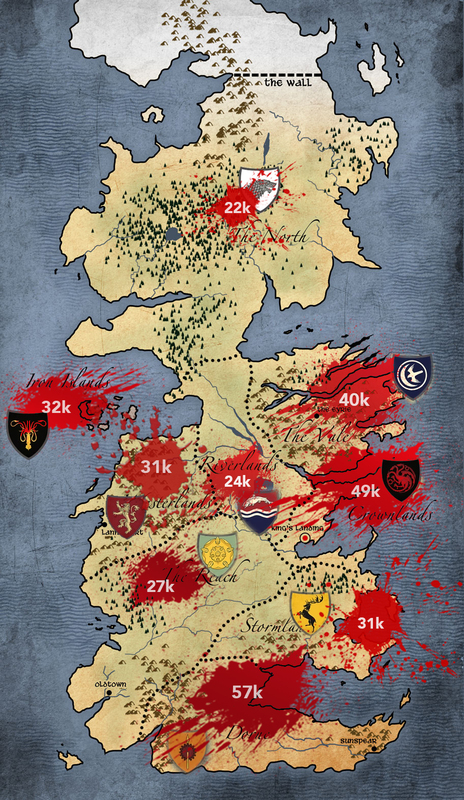 This is the map of Westeros where the size of the blood splatter represents the number of SS killed per Region. Given that the Superlative in Crownlands was granted to the Alliance who killed the greatest number of SS, we expected the biggest blotch of red to land there. It was large, but bigger still was the number of dead SS in the Dorne. The superlative there, if you recall, was granted to the Alliance with the highest overall number of actions. Death: the universal action! Well done, all, for your bloody efforts. Our last post-phase analysis for the Fugitive phase stays with the theme of dead sworn swords. Taking our cue from the Crownlands superlative, where Snow Patrol was able to dispatch 356 sworn swords per participant, we asked our data maester to determine the top three deadliest Alliances were in the rest of Westeros. Unsurprisingly, no other region enjoyed the overall level of carnage achieved in Crownlands by Snow Patrol, La Quinzieme Flamme, Sandship, and others. Still, we have to call out Llamageddon in Dorne who managed to kill 280 SS per participant. A respectful, call out, that is, as we wouldn’t want to upset them. We’ve seen what they can do with a sword. Well done to all Alliances who took part in the Fugitive Phase. Enjoy your hard-earned rewards and titles. Just a reminder to all AvA players that an AvA test phase will take place tomorrow starting at 11:00am ET (16:00 UTC). We hope you will be able to take part in whatever amount of time you can spare, and help us test changes intended to battle “Pending Results”. For more information, please see our Test Phase blog.